There are several ways to beat the market, and investing in small cap stocks has historically been one of them. We like to improve the odds of beating the market further by examining what famous hedge fund operators such as Jeff Ubben, George Soros and Carl Icahn think. Those hedge fund operators make billions of dollars each year by hiring the best and the brightest to do research on stocks, including small cap stocks that big brokerage houses simply don’t cover. Because of Carl Icahn and other elite funds’ exemplary historical records, we pay attention to their small cap picks. In this article, we use hedge fund filing data to analyze Snap-on Incorporated (NYSE:SNA). Is Snap-on Incorporated (NYSE:SNA) a sound stock to buy now? Hedge funds are becoming more confident. The number of long hedge fund positions rose by 1 lately. Our calculations also showed that SNA isn’t among the 30 most popular stocks among hedge funds. SNA was in 25 hedge funds’ portfolios at the end of December. 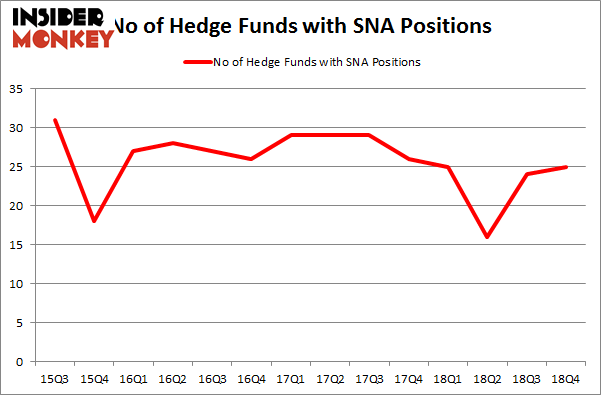 There were 24 hedge funds in our database with SNA holdings at the end of the previous quarter. We’re going to take a gander at the fresh hedge fund action encompassing Snap-on Incorporated (NYSE:SNA). What have hedge funds been doing with Snap-on Incorporated (NYSE:SNA)? At Q4’s end, a total of 25 of the hedge funds tracked by Insider Monkey were bullish on this stock, a change of 4% from the previous quarter. Below, you can check out the change in hedge fund sentiment towards SNA over the last 14 quarters. With hedgies’ capital changing hands, there exists a select group of key hedge fund managers who were boosting their stakes meaningfully (or already accumulated large positions). More specifically, Ariel Investments was the largest shareholder of Snap-on Incorporated (NYSE:SNA), with a stake worth $127 million reported as of the end of September. Trailing Ariel Investments was Gates Capital Management, which amassed a stake valued at $92.9 million. AQR Capital Management, East Side Capital (RR Partners), and Pzena Investment Management were also very fond of the stock, giving the stock large weights in their portfolios. Consequently, specific money managers were leading the bulls’ herd. Highbridge Capital Management, managed by Glenn Russell Dubin, initiated the most valuable position in Snap-on Incorporated (NYSE:SNA). Highbridge Capital Management had $0.9 million invested in the company at the end of the quarter. Benjamin A. Smith’s Laurion Capital Management also initiated a $0.5 million position during the quarter. The other funds with brand new SNA positions are Gavin Saitowitz and Cisco J. del Valle’s Springbok Capital, Mike Vranos’s Ellington, and Ben Levine, Andrew Manuel and Stefan Renold’s LMR Partners. Let’s now take a look at hedge fund activity in other stocks – not necessarily in the same industry as Snap-on Incorporated (NYSE:SNA) but similarly valued. We will take a look at American Financial Group (NYSE:AFG), ANGI Homeservices Inc. (NASDAQ:ANGI), 58.com Inc (NYSE:WUBA), and Andeavor Logistics LP (NYSE:ANDX). This group of stocks’ market values are closest to SNA’s market value. As you can see these stocks had an average of 20 hedge funds with bullish positions and the average amount invested in these stocks was $270 million. That figure was $471 million in SNA’s case. American Financial Group (NYSE:AFG) is the most popular stock in this table. On the other hand Andeavor Logistics LP (NYSE:ANDX) is the least popular one with only 6 bullish hedge fund positions. Snap-on Incorporated (NYSE:SNA) is not the most popular stock in this group but hedge fund interest is still above average. This is a slightly positive signal but we’d rather spend our time researching stocks that hedge funds are piling on. Our calculations showed that top 15 most popular stocks among hedge funds returned 21.3% through April 8th and outperformed the S&P 500 ETF (SPY) by more than 5 percentage points. Unfortunately SNA wasn’t in this group. Hedge funds that bet on SNA were disappointed as the stock returned 10.8% and underperformed the market. If you are interested in investing in large cap stocks, you should check out the top 15 hedge fund stocks as 12 of these outperformed the market. 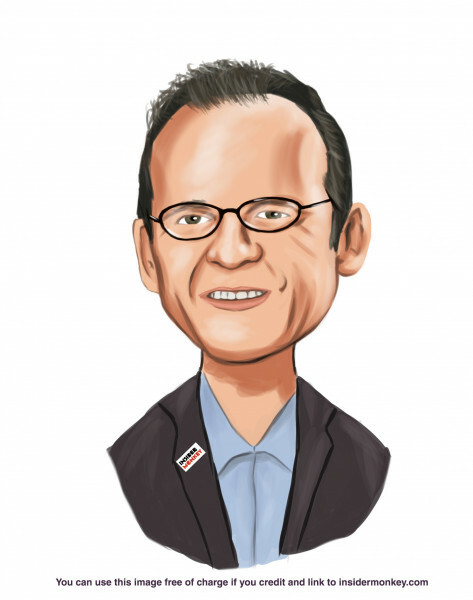 Here’s What Hedge Funds Think About HollyFrontier Corporation (HFC) Here’s What Hedge Funds Think About Discovery Communications Inc. (DISCK... Wolf Hill Capital’s Q1 2019 Investor Letter Did Hedge Funds Drop The Ball On Melco Resorts & Entertainment Limited... Is Macy’s, Inc. (M) A Good Stock To Buy? Were Hedge Funds Right About Flocking Into HEICO Corporation (HEI) ?